. That journaling Bible has become difficult to find and although I enjoy the actual set up of the Bible with the wide margins for journaling, it’s not my favorite Bible. I’m just sentimentally attached to my other two Bibles, so I’ve been using them the last couple of weeks, 1) because I missed opening them and 2) to show you that you do not have to have a “Journaling Bible” to practice Bible journaling.
. I say first because shortly after I purchased mine, I purchased one for each of my children. This is a nice no frills Bible. 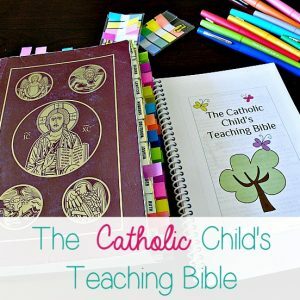 This is the Bible I spent months flipping through when I compiled The Catholic Child’s Teaching Bible. It wears well, is not too large or too small and is really just a great over all Bible. are just standard sized…but you can still use this Bible as a journaling Bible. Let me share a couple of examples with you. Instead of journaling on the actual Bible, I created a page in a notebook and then used washi tape to adhere it into my Bible. I actually really like this for a couple of reasons: first, if I make a mistake–which I make so many! When I make a mistake, it’s not in my Bible permanently. I can just get another sheet of paper…any paper by the way: scrapbook, notebook or even a clear binding cover…and start over. I also like that in this particular example, not only have I used the right side of my brain to get a little artistic on one side of the paper, I still have all this space on the back to make notes, link certain references or maybe include a quote from one of the saints on that particular verse or topic.
. This time I just used a bit of paint and used some stamps. Super simple, I think very pretty and can be done even without wide margins. 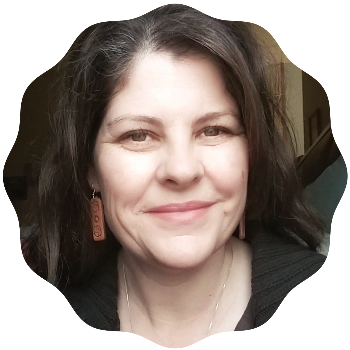 ; I may need to check into that soon as I can tell a huge difference in my eyes since I turned 40 a few years ago. Anyway, in this Bible, I delicately worked around the edges with some vine work, I used alphabet stickers for one of my favorite verses on this page and I taped in a pretty journal cover I had. And let me confess right now, I did tape it in because it is pretty…but also, I didn’t like the way my journaling looked on that page and so I covered it up with a pretty cover and washi tape. I think washi tape has replaced Twix candy bars as my new love language by the way. 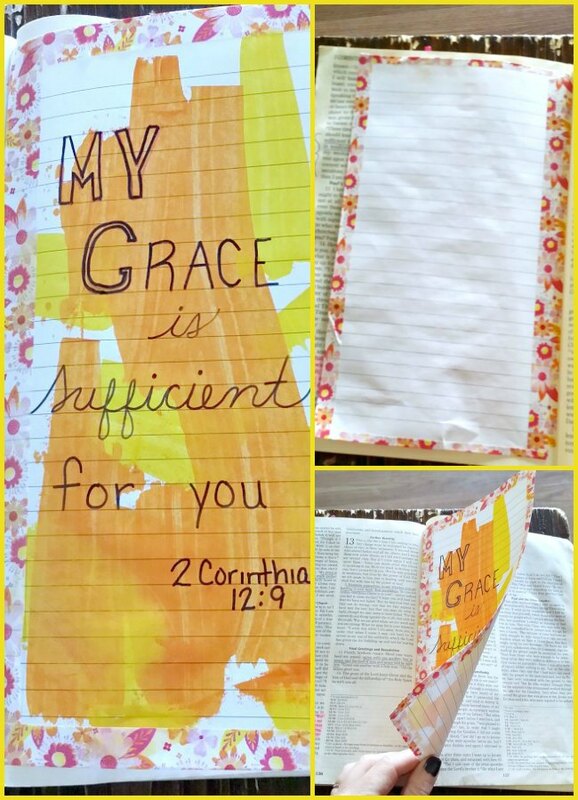 One other thing I have done as I’ve spent time in the Word Bible journaling…and this one may appeal to those who are really hesitant to begin Bible journaling, I used washi tape. I just used a piece of washi tape on the edge of a page I wanted to be able to find easily. I showed you how I use tabs to mark favorite passages, and this is along the same lines, just a little more subdued. 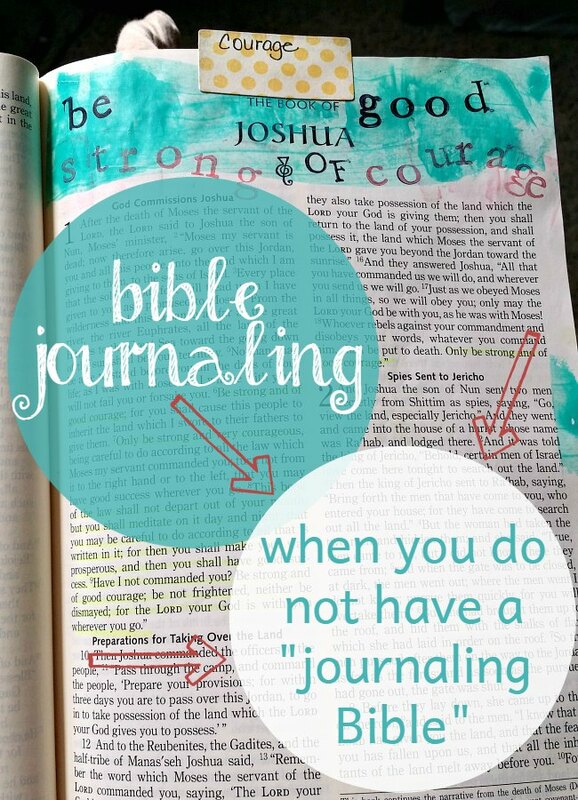 I hope some of these pictures and suggestions will encourage you to practice Bible journaling even if you do not have a journaling Bible. *Blessed is She and Our Sunday Visitor has designed a Catholic Journaling Bible. 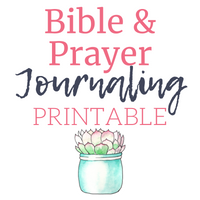 Click here to purchase and here for my Catholic Journaling Bible post and flip through video I made. 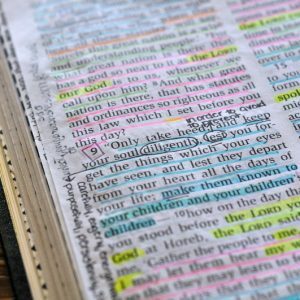 Can you explain a little bit more about how to tape a page in your bible? I dont quite get it from the pic! Thanks!!! Hi Heather. I finally have a new post up showing more of how I do this. Thanks for asking. 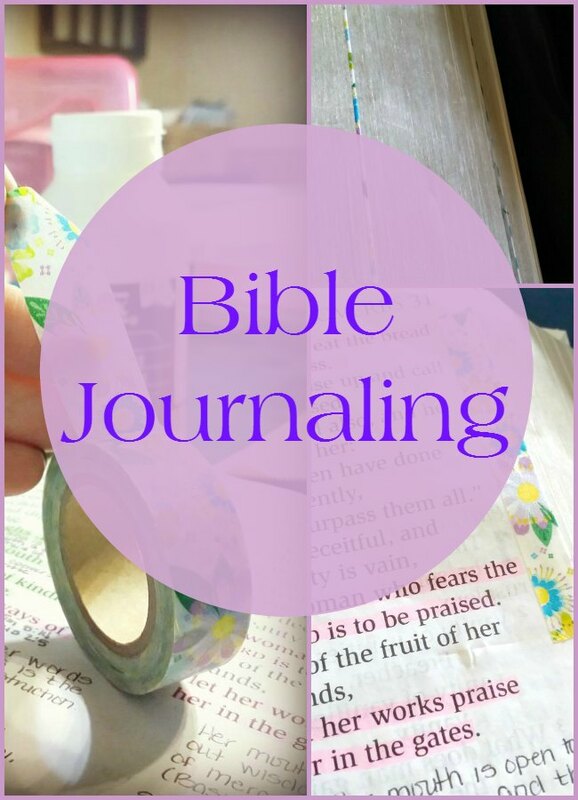 Have you heard about the new journaling Bible coming out? It’s by Our Sunday Visitor for Blessed is She. I’m pretty excited! It’s on the Blessed is She website-I think they’re shipping out in January and taking pre orders now. I have and I’m so excited! I’ve never used washi tape, does it easily release like painters tape (low tack), or is it permanent? I’m a complete newbie in bible art journaling but my idea is to washi tape tissue paper into my bible and art, notate on it. I saw elsewhere where clear gesso was used on tissue to allow for great art and writing without bleed through on the thinness of tissue and of course tissue won’t bulk up the binding of my bible as much. I love all your examples! Can you use a standard bible, very Thin pages to journal in? Using water color pencils. I have. But a little bit of bleed through and crinkle to my pages doesn’t bother me. You might test a page in the index to see if you’ll mind the result. Mhhmmmhh waaaaadsshhhiiiii taaaaape. I get all fuzzy and warm just thinking about it in my Bible! I’m a scrapbook junky and a little ashamed that I didn’t think of it already. Thank you so much for the idea! Welcome, welcome welcome. I ♥ washi tape too. Is it wrong to look around your stuff wondering what you can add washi tape to? I agree! I use washi tape anywhere I can! Thank you for this. I have bought some bible journaling tools so when I found the right bible I would be ready. But I wasn’t thinking about making mistakes in my bible, since I’m not an artist, & they wouldn’t be able to be removed. Now that I found your pin, I’m going to start my first one. Thanks again. Yay! So happy you found something helpful here. All glory to God! I’m a rather new Washi tape addict. I’m not sure I would ever think to use it in my Bible. Thanks for the idea and the other great ideas I’ve gleaned her today. You’re welcome Pamela! Washi tape is perfect to use in the Bible, just enough pop and style. Do you run the washi tape just along the edge, or do you put half on one side, and fold it over to the other side, too? I have never used it, but after reading this, i picked some up at Michaels. I just liked the way yours shows when it is closed. Thanks for a new way to Study the Word!! Yes, Karen I have it folded over so a little bit is on each side. Awesome tips! I don’t have a journaling Bible but have wanted one so bad. I’m so afraid to take notes in my Bible so this I could definitely do. What a lovely way to personalise your bible and to journal. I love the washi tape and paint ideas. I love that you are sharing such fun (and cute!) 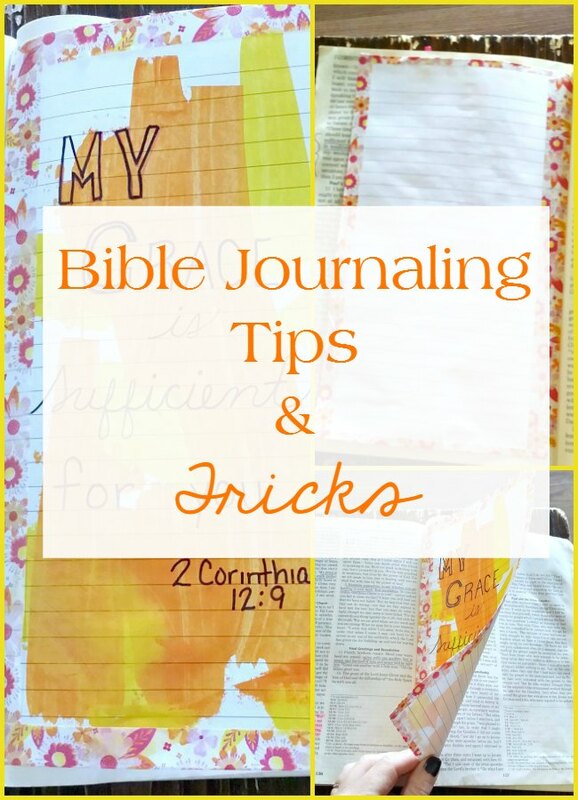 practical tips for bible journaling, Jenny. This whole “official” Bible journaling thing is pretty new to me, but fascinating. Thanks for sharing! Thanks for the visit Sharita. I’m enjoying this year learning a new way to spend time in the scriptures. Thank you for this post…It amazes me how you manage to fit so much into your life! I appreciate it when you say you missed your Bible…I absolutely love my Bible! When I say I missed my Bible, and I’m sure you can relate, I missed the sound of its crinkly pages and even though I haven’t taken many notes in it since it’s pages are thin (my Large Print) I remember when or where I’ve read things. My Ignatius Bible is plain ‘ol worn–front cover missing worn–and I love that I spent so much time with it to create a book to help parents and children use the scriptures in the day to day. 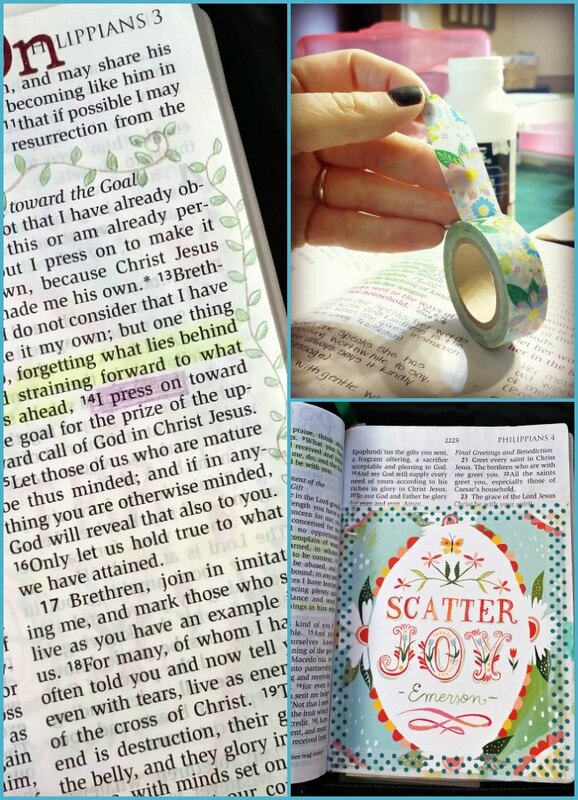 I like the idea of adding journaling pages to your Bible with Washi tape (and like a few others, I’ve never used it). I do all of my journaling in a journal instead of in my Bible, but this may help me keep notes RIGHT THERE so I never forget! Joining you from Thought Provoking Thursdays–and you did provoke my thoughts today! So kind Debbie, I appreciate the visit. I do like the fact I can keep everything together. OH I AM BECOMING A LOVER OF WASHI TAPE TOO! I GOT A JOURNALING BIBLE FOR CHRISTMAS AND I AM STILL HAVING A HARD TIME ACTUALLY WRITING IN IT. THESE ARE GOOD IDEAS! I’m glad you enjoyed the post Alyssa. Washi tape is so much fun and easy to use to add that personal touch. Jenny, I love this. I’m one of the few people on the planet that has never used Washi tape. Does it stick to the page? I love how Bible journaling personalizes the pages and helps me remember those verses that have touched my heart in the past. Blessings to you! Hi Deb, I just started using Washi Tape. I always thought “What’s the big deal?” And now I think it may be one of my love languages like I mentioned! It does stick to the paper, but can be easily removed and re-positioned. It’s such an easy way to personalize anything, especially for the non crafty (me!) and it’s pretty. Hi Ashley, I use Washi tape to tape it in and yes, it turns just like a normal page. I tape it into the center as close as possible. Yes ma’am! Thank you so much!